A great opportunity to join a fast-growing international company as a committed Sales Representative, working in the Workwear Sector and covering the South West of France. Confidently sell to existing, and develop a new distributor network in the workwear sector. Develop and host presentations of the product catalogue to existing and potential distributors to generate new relationships. Train, develop and make joint end-user consultative calls working with the distributors’ sales team. Responsible for increasing the number of direct sales to distributors and, to a lesser extent, end users and being able to provide evidence of this when directed to do so. Based and covering the South West of France so the candidate is expected to live here, preferably in the Bordeaux/ Toulouse area. Must be proficient in the English language ( both written and verbal) as this is required for international sales meetings. 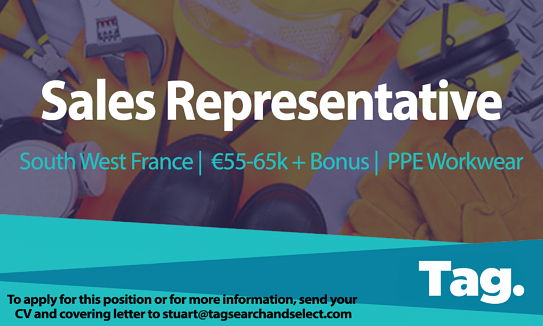 To apply for this role or for more information please send your CV and covering letter to stuart@tagsearchandselect.com for a confidential consultation.